The LaoLux Laboratory (LLL) aims to build capacity for investigations of human and animal infectious diseases that are of relevance for Lao PDR. All studies are conducted in close collaboration with local partners and focus mainly on the molecular epidemiology of vaccine-preventable infectious diseases, as well as animal and zoonotic diseases. These studies have importance for stakeholders in public and animal health by providing estimates about the burden of specific infections, by promoting outbreak control and vaccination programmes, by improving animal health and productivity, and by proposing measures to optimize national health strategies. In this year’s report, we show preliminary data from a study of vaccine immunogenicity. Our previous data showed low immune response in children vaccinated with 3 doses of pentavalent vaccine in 3 provinces of Lao PDR. The follow-up study shows that, despite an overall improvement in immunogenicity, antibody levels remain low in vaccinated children. The levels are particularly low in children vaccinated in health centres far from the district hospital. The data led us to recommend that a booster dose of pentavalent vaccine to be introduced into the routine childhood vaccination schedule. This was formulated as a policy brief and distributed to Lao National Immunisation Technical Advisory Group (NITAG), Expanded Programme on Immunisaion (EPI), WHO, UNICEF and Luxembourg Development Corporation. One of the recent successes of the Lao National Immunisation Programme was the elimination of maternal neonatal tetanus in 2014. This was largely a result of the policy to vaccinate women of child-bearing age and also during pregnancy, coupled with a promotion of hygienic birth practices. We completed a study in Savannakhet Province to assess the vaccine coverage during pregnancy and also the seroprotection of mothers and newborns in an area covered by the national free ANC scheme. Our findings highlight a low vaccination coverage during pregnancy in these women, and we make recommendations to enhance coverage including vaccinating at ANC 1 and 2, rather than delay. Our findings and policy recommendations have again been formulated as a policy brief. A major focus of our research is hepatitis B virus (HBV). Lao PDR has a high burden of HBV chronic infection and high levels of liver cancer. In this report, we present data from one of our studies which determined HBV and hepatitis C virus (HCV) exposure and infection in a vulnerable group – female garment factory workers. We found high levels of exposure in these young women and low knowledge and access to health facilities. In addition to vaccination of these women, the occupational health service should be strengthened. In a collaboration with the Children’s hospital in Vientiane Capital, we were interested to determine the seroprevalence of varicella in the Lao population and also to determine the proportion of fever rash cases that were caused by varicella infection. Our data highlight several important issues. Firstly, varicella zoster virus infection is widespread and largely unrecognized in Lao PDR, and secondly, fever rash surveillance in Lao PDR is inadequate, with missed measles and rubella cases among children. These observations have important implications for public health policy, which we report. We also present data on hepatitis E virus (HEV) in Lao PDR. This zoonotic virus is found in humans and animals such as pigs. In 2 studies, we demonstrated that HEV is highly prevalent in humans, swine and ruminants in Lao PDR. By determining risk factors associated with infection, we are able to make concrete policy recommendations to reduce exposure and risk. 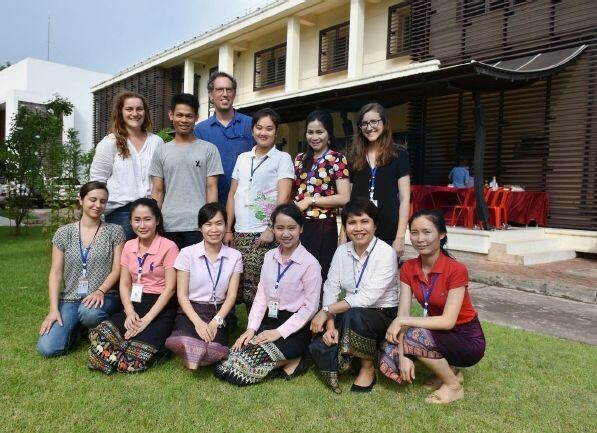 We were also joined by Laetitia Bosc, a Masters student from Institut Pasteur, Paris, who was conducting research on the knowledge, attitude and practice (KAP) of Lao adolescent girls towards vaccination. Emma Pollack, a Public Health graduate from Cornell University, joined us for 6 months to work on blood donor KAP regarding blood safety. Noy Davy from the Lao military medical service has also joined our laboratory for 1 year to receive training in laboratory techniques and research. The laboratory is largely funded by a grant from the Government of the Grand Duchy of Luxembourg and operates in close partnership with the Infectious Disease Research Unit at the Luxembourg Institute of Health, Luxembourg. A “Lao Equity through policy Analysis and Research Networks” (LEARN) research grant was awarded to Dr. Phonethipsavanh Nouanthong in 2018 to investigate the immunogenicity of human papillomavirus in Lao girls. We also receive support from ARBOSHIELD grant to facilitate training of Lao military staff.